Many customers need education or training before you can sell them your product or service. And, they need to see themselves using your product or service before you can sell to them. The education or training of your customers or probable customers is done through a nurturing program. A nurturing program can have a modest goal - to remain top of mind with a group of customers who will be in the market for your services or products. From 1963-1977, Joe Girard sold an amazing number of cars-- 13,001 in his 15 year career! More than 6 cars a day, day in day out, for 15 years. 6 cars a day is more than many entire dealerships do. How did he do it? He hand wrote and mailed greeting cards to everyone on his list. Regularly, once a month, if you were on Joe's list, you got a greeting card from Joe saying: "I Like You." Joe Girard was simply reminding people that when it came to buying a car, Joe was thinking about them. Not a long or overcomplicated message. Not a message about cars, either. Just a reminder. Effective, in part, because it was so time consuming. Joe's list at the end of his career was over 16,000 names & addresses. Girard's messages, all hand written, all sent by mail, like clockwork each month. Shows a certain doggedness or relentlessness, don't you think? Probably trust a guy like that to get you a good deal. There is nothing wrong remaining top of mind for the right message. Indeed, you have to start with a Top of Mind program, or set of tools. But, more modern nurturing programs go beyond just being top of mind. They are designed to establish you as an expert in the eyes of your customers, prospects and a "community of interest". Modern nurturing programs aslso try to expand the reach of your message from customers to people just like your customers - but who aren't sold, yet. 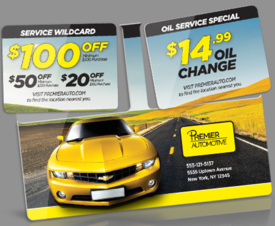 For example, suppose you are an Premier Automotive trying to build out your business by sending out a coupon monthly for a discounted oil change. There are (4) things wrong with this strategy. 2. You are training your current customers to be disloyal or shop solely on price. 3. You are not reaching past your customer list - nobody is going to share their coupon into their own network. 4. Finally, being top of mind for the annnoying message - get an oil change- is not where you want to be. On the other hand, you could try this type message - send this to your current customer list, with the offer on the left hand side. This message is intended to establish you as an authority beyond their own customer list. When should you buy more more expensive oil for your car? Science has confirmed what many NASCAR teams already know: synthetic oils last longer, provide better protection and form less sludge and deposits. But, when does it make sense for you to buy the more expensive synthetic oil because it lasts longer, provides better performance? Well, a simple calculation is that if you plan to drive your current car for more than 100,000 miles, it makes sense to purchase synthetic oil, now. This nurturing message is more likely to convert casual customers into loyal & interested customers than simply sending a discount coupon on a monthly basis. Which do you think will work better? 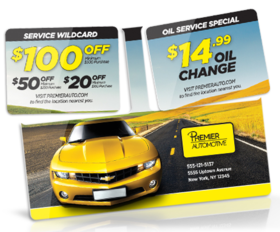 Discount alone or discount with objective story about when to change your oil - especially if the story is sent out on a timely basis?